Not put so much detail into the initial figure. As I am mounting the figures singly, theoretically I can always add the detail later. Build the figure completely before painting. Interestingly, the second point taught me why the first point may be more theoretical than fact. Once the figure is completely built, it is very hard to get the paint brush in to some confined spaces. With cavalry, there are more of those spaces than with infantry (e.g. the entire front of the rider is hard to reach once it is glued to the horse). I hope to have pictures of the prototype (which is finished) by the end of the weekend. I've made pretty good progress on the remainder already. I figured out that I have got to find a way to use these figures soon, otherwise I will lose momentum - and thus interest in finishing the project - which would not be a happy thing! 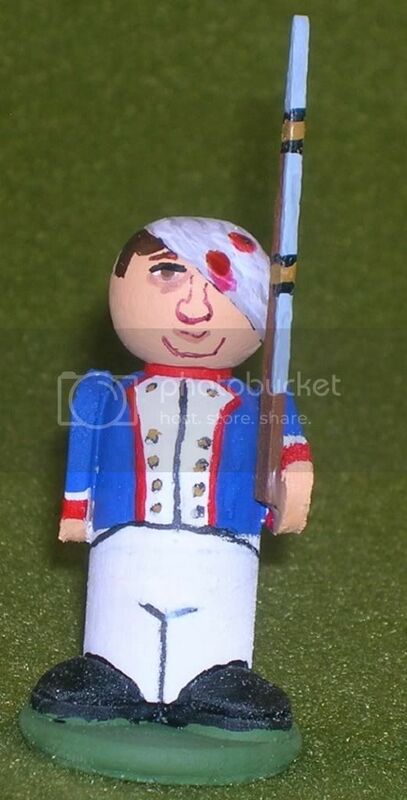 So, I decided that I have got to take up Napoleonic skirmish games, like Song of Drum and Shako (horrible name, fun game) and Sharp Practice. The former is good for up to about 20 figures, I think, while the latter plays better at 20+. So, by the time SDS is getting unmanageable, SP will be starting to get interesting. I will probably need to paint a British Foot unit next. As I hinted in my last post, I am finished with the French Ligne unit for now. I have the shako plates to paint, but I just haven't been able to muster the effort. However, I've already started making my British Light Dragoons (pictures and tutorial on that coming up), so that is getting the old blood flowing. Here is a picture of the full 24 figure unit (six companies of 4). 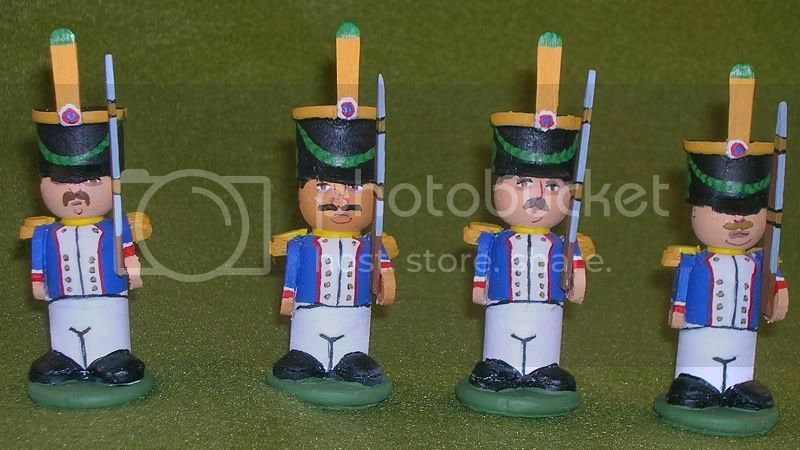 The last ones to be finished were the Ligne Voltigeurs. I've also got one wounded soldier, for a little variety. All in all, a very fun unit to paint. I look forward to starting the next unit, but next time I am going to try and cut down on the detail. We'll see if I can hold to it.